If you have any questions or want to purchase below tires contact us or call at (509) 346-2028. Our tire and rim policy is the way they are mounted is the way they are sold. They are priced accordingly. If you want rims/tires separated the dismounting fee is extra. 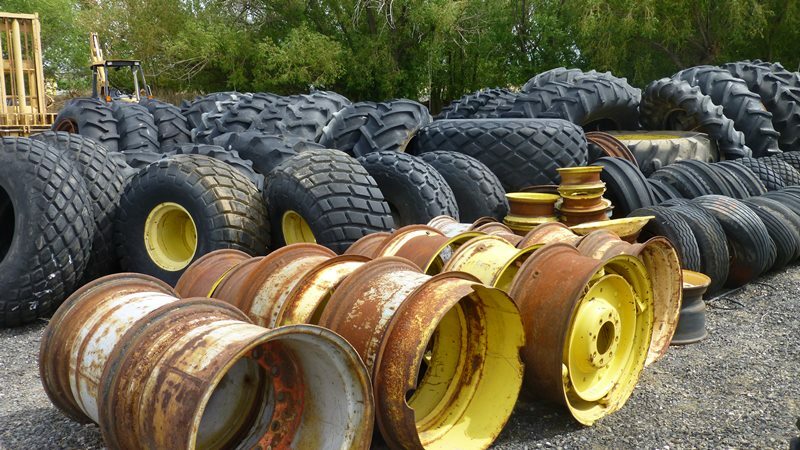 All used tires are sold in AS IS condition. Feel free to ask for pictures before you purchase. 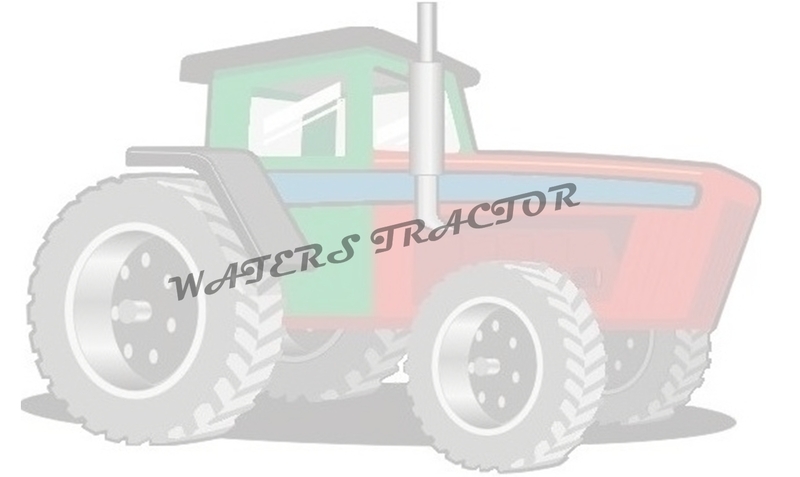 There are 3 main types of rear tractor tire tread. R1: Best traction for general Ag farming, tires have deep V bar pattern. R3: Turf tires used to minimize soil or grass disturbance. The tread depth of an R3 tire is usually half that of an R1 tire. R4: For industrial service or highway department work. Much stiffer tire with more plies. The tread depth of an R4 tire is about 70% of an R1 tire. Inventory subject to change at any time. 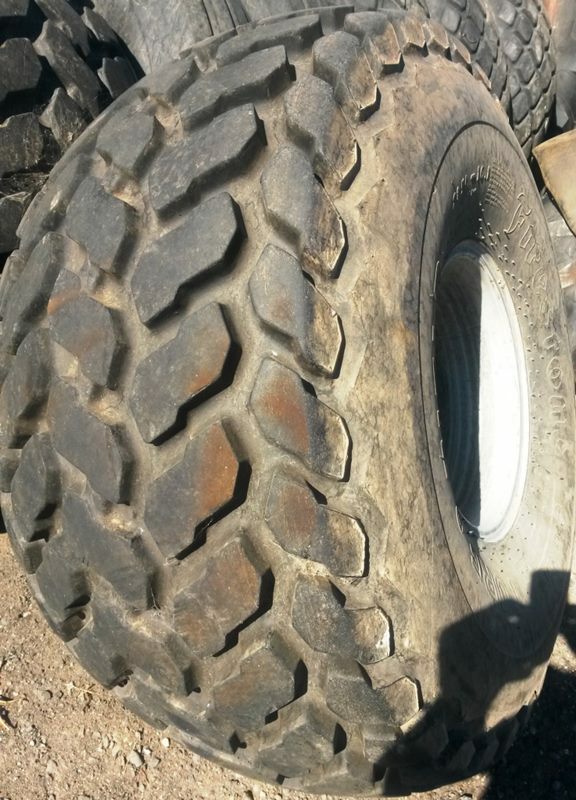 (1) 14.9R46 (420/80R46) Goodyear Dyna Torque radial R1 tractor tire in excellent condition with 75% tread. (2) 14.9R46 (420/80R46) Goodyear Dyna Torque radial R1 tractor tire in good condition with 50% tread. Mounted on John Deere stub disc type plate rims. $500 each, includes rim, holding air. (4) 14.9R46 (420/80R46) Goodyear Dyna Torque radial R1 tractor tires with 25% tread. Mounted on John Deere stub disc plate type rims. Good for duals. $400 each, includes rim, holding air and most have fluid. 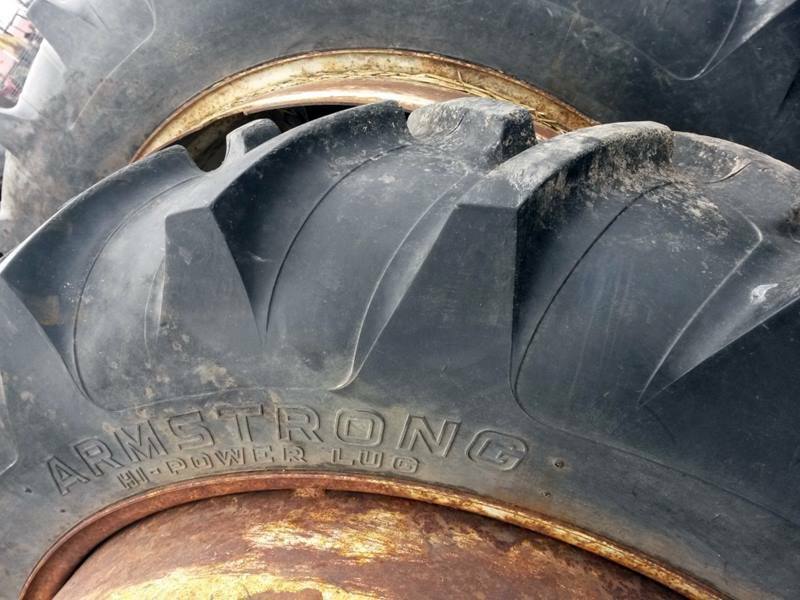 (2) 12.4-42 Firestone Field and Road 151 R1 tractor tires with 50% tread mounted on Unverferth 9 bolt dual rims in good condition. 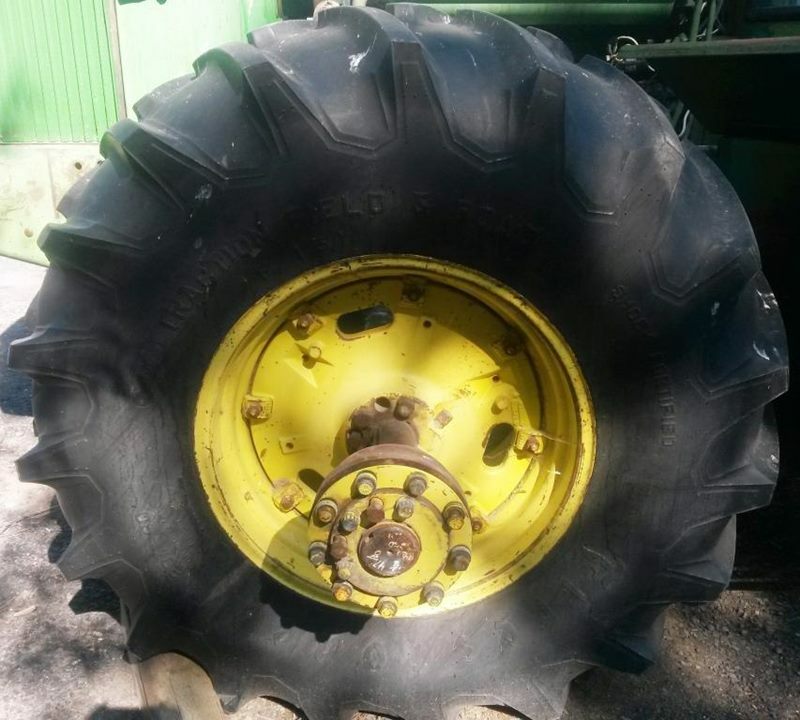 (2) 20.8-38 Goodyear radial tractor tires in fair condition at 20%, (good for duals) mounted on 10 hole dual rims. Pair $550, holding air, includes rims. (2) 20.8-38 Firestone R1 tractor tires in marginal condition at 10% (ok for duals only). Mounted on 8 hole dual rims. 8 Holes measure 14-1/2" center to center with a 12-3/4" pilot hole. Pair $250, holding air, includes rims. 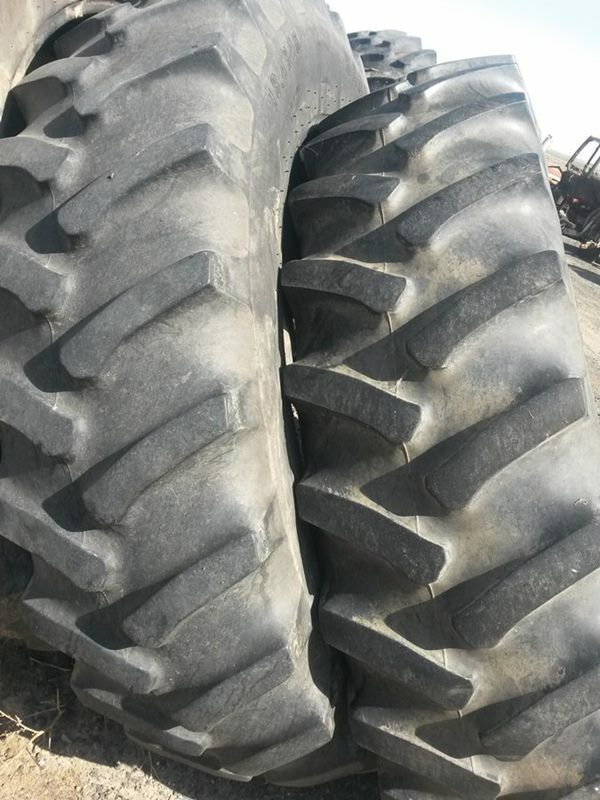 (2) 18.4-38 BF Goodrich tractor tires. R1 tread at 45%. Mounted on 9 hole dual rims. Weighted with fluid. (3) 16.9-38 Firestone Deep Tread (for wet or muddy conditions) tires in marginal condition with poor tread. Tractor puller tires. 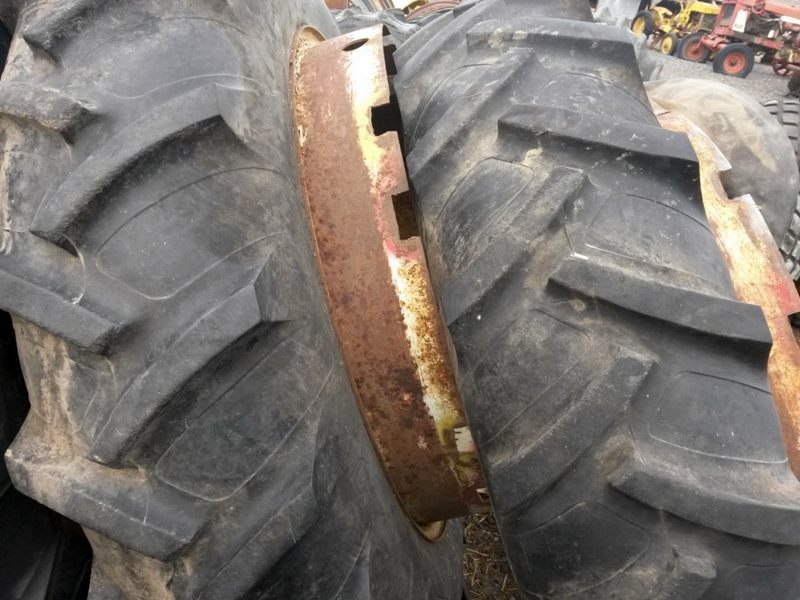 (2) 13.6-38 Titan Hi Traction Lug R1 tractor tires in excellent condition with 90% tread mounted on rims with center missing. (1) 13.6-38 Goodyear Dyna Torque II R1 tractor tire in good condition with 55% tread. Mounted on John Deere double drop open center double bevel rim in good condition. L loop type rim in good condition, fits Farmall C, Super C, 200, 230 and others. (2) 9.5R36 Kleber Super 3 Radial tractor tires. R1 tread at 45%. Mounted on 8 loop rims in excellent condition. (2) 13.6-28 R1 tractor tires at 50%. (tires not matched) Filled with fluid. Mounted of 6 loop rims. (4) New 16.00 X 25 Rock Lug E3/L3 28 Ply R4 Industrial Loader Tires. (2) 16.9-24 Firestone 151 Gum Dipped R1 tread at 25% and sun cracking. Good tractor puller tires. (2) 16.9-24 Goodyear turf tread. Marginal condition with sun cracking. 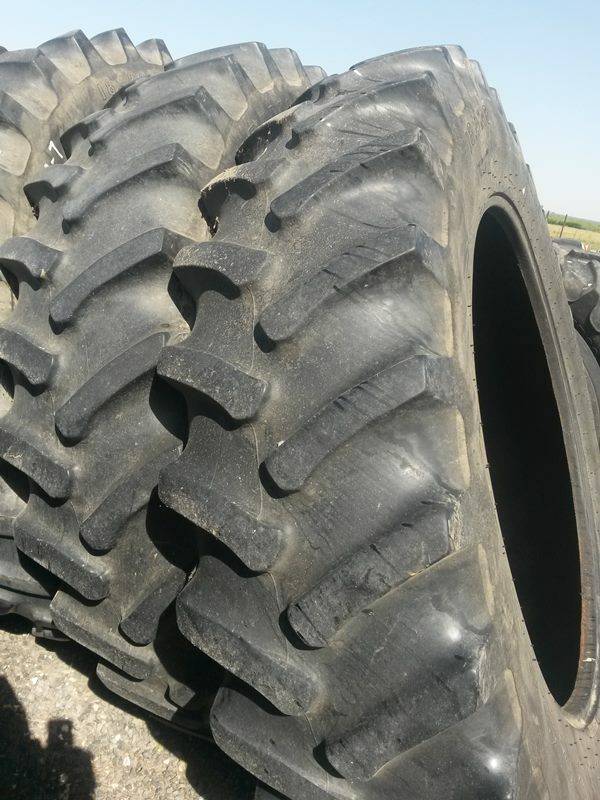 (2) 12.4-24 Goodyear tractor tires. R1 tread 60% but chipped, sidewall worn. Mounted on 8 on 8 hole rims. 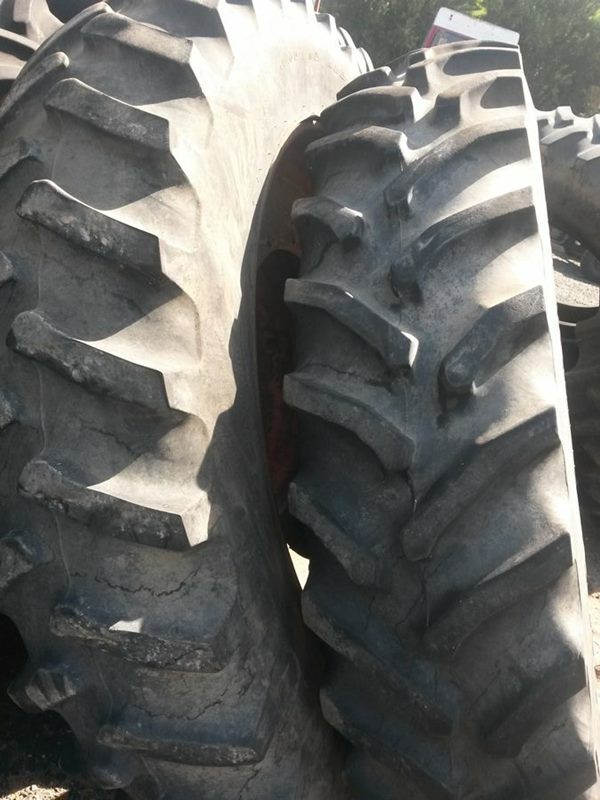 18.4-16.1 GY tractor tire. R1 tread in fair condition. Mounted 8 on 6" rim with fluid. (1) 8" hub spacer X 9 hole. Also a large selection of New & Used Tractor Rims & Hubs in stock.